Four Eritrean teenagers, believed to be in council care, have been reported missing from Northamptonshire. Magdas Kiros, Bezauit Sardor, Zelalem Gegzihabet and Daniel Tecqldebasta, all aged 16, were last seen on 20 March. 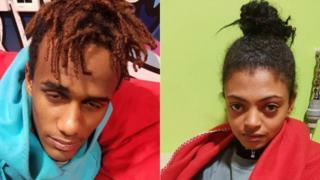 The two boys, Zelalem and Daniel, were last seen at 08:30 GMT while the girls, Magdas and Bezauit, were last seen at 21:30. Northamptonshire Police said it is concerned for the welfare of the teenagers. Neither the police or Northamptonshire County Council are specifying where the teenagers disappeared from, but it is believed they were in the care of the county council.